Please Note: This product is available for pre-order and will ship in July 2018. 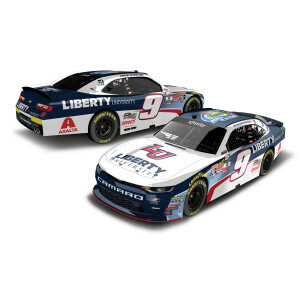 In his first season of NASCAR Xfinity Series™ competition, William Byron shot out of the gate strong, capturing a top-10 finish in the season-opening Daytona race. Byron’s momentum continued, going on to capture 12 top-five finishes, two pole positions and an unbelievable, four series wins, earning the 19 year old the 2017 NASCAR Xfinity Series™ championship title and a very well-deserved Sunoco Rookie of the Year™ award. Commemorate Byron’s outstanding rookie campaign the best way possible – with a die-cast of his No. 9 Liberty University Sunoco Rookie of the Year™ Chevrolet Camaro. Each 1:24 and 1:64-scale die-cast is produced with the Galaxy Color finish.